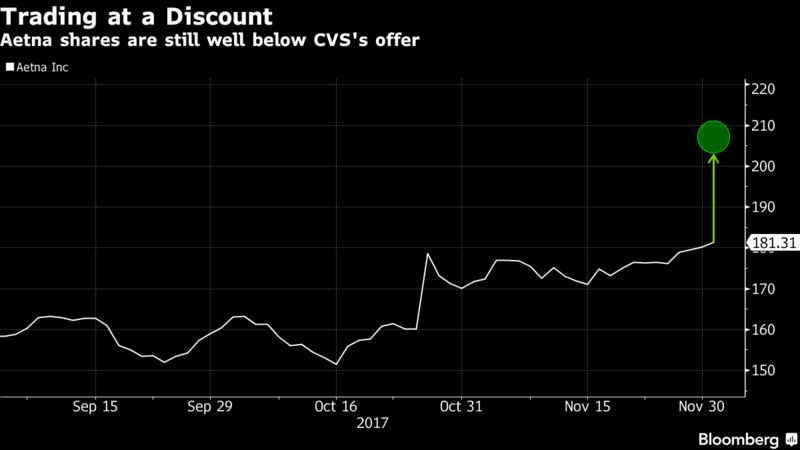 CVS Health Corp.’s $67.5 billion takeover of Aetna Inc. will test the Trump administration’s approach to far-reaching corporate takeovers, just weeks after the U.S. government sued to block a major telecommunications merger. The health-care deal unveiled Sunday would create an industry giant with over $240 billion in annual sales with a hand in insurance, prescription drug plan administration, retail pharmacies and corner clinics. The companies said the combination will save $750 million in costs and bring consumers better, more efficient health care. In the past, deals combining companies up and down a chain of business -- such as a supplier and a distributor -- have been viewed as posing less anticompetitive risk than combinations of direct rivals. Last month, however, the Justice Department sued to block just such a “vertical” merger between AT&T Inc. and Time Warner Inc., saying it would harm consumers and limit their media content options. Aetna shares were trading at $184.84 at 6:33 a.m. in New York, well below CVS’s $207-a-share offer for the company -- a sign investors are skeptical the deal will close at the current price. How much scrutiny the deal gets from the government may depend on which federal agency reviews the takeover -- the Justice Department, or the Federal Trade Commission. The FTC has typically handled mergers of retail businesses like CVS. While it allowed Walgreens Boots Alliance Inc. to buy more than 1,900 Rite Aid Corp. stores earlier this year, the deal had to be significantly scaled down to gain the regulator’s approval. The Justice Department, meanwhile, successfully sued to block insurance mergers between Anthem Inc. and Cigna Corp, and Aetna and Humana Inc. In the past, vertical deals have typically won approval after companies agree to restrictions on how they operate. That may be changing. The Justice Department’s new antitrust chief, Makan Delrahim, has criticized past settlements that allowed vertical deals with behavioral restrictions. In a speech last month, Delrahim said such conditions don’t work and force antitrust enforcers to become regulators. That view was behind Delrahim’s decision on Nov. 20 to sue to block AT&T’s proposed acquisition of Time Warner, a vertical deal that would bring together Time Warner content like HBO with AT&T’s pay-TV and wireless distribution. That doesn’t mean there’s heightened hostility toward vertical deals at the Justice Department, but CVS might prefer the Aetna deal to go to the FTC given Delrahim’s criticism of behavioral fixes, said David Kully, an antitrust lawyer at Holland & Knight in Washington and a former Justice Department attorney. “Delrahim was very clear in his concerns about behavioral decrees and then put his money where his mouth is when he brought the AT&T case,” Kully said. One point in favor of the CVS-Aetna deal is that there’s already another large insurer with many of the characteristics of a combined health companies. UnitedHealth Group Inc. offers health insurance, administers drug benefits and runs a growing network of doctors and clinics. But the CVS-Aetna combination takes integration to a new level with its 9,700 retail drugstores. It would also allow CVS to expand its 1,100 walk-in clinics, saving Aetna’s insurance customers money by steering patients away from expensive hospital emergency rooms. A condition to an approval could be measures preventing Aetna from steering patients to CVS pharmacies over competitors such as Walgreens, said Rie, who noted that CVS may be better off if the FTC takes the review. One of the few areas where the companies directly overlap is in the Medicare drug business. CVS is already the largest provider of Medicare drug plans, and Aetna is the fifth largest, according to data compiled by Bloomberg Intelligence. Michael Newshel, an analyst at Evercore ISI, said Aetna would likely need to divest some or all of its Medicare drug-benefits business in a CVS merger. He anticipates a deal would likely go through in the end no matter who reviewed it. The deal “would definitely be scrutinized, but ultimately we still see a path for it to get through,” Newshel said in an email. Evercore worked on the deal and Newshel said he’s suspending his analyst coverage of Aetna.